There are times when nutrients may be absent from a soil and can adversely effect trees health. Once a Soil Sample is taken and laboratory analysis is complete a comprehensive tree care plan can begin. Often times this will involve deep root feeding. 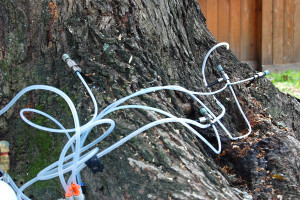 Deep Root Feeding is the most effective method for delivering essential nutrients to trees. The ISA Certified Arborists at Warren’s of Kingwood is the best in the business when it comes to feeding your trees! Drought conditions cause serious long term nutrient problems for trees that may take years to correct, get involved early and call Warren’s today for an ISA Certified Arborist at (281) 354-7111 for a Consultation. Over fertilizing is common as fertilizers are basically different kinds of nutrient salts. When too much is applied, the salts attract and hold all the ground moisture and the tree will begin to look as if it is suffering from drought. How can you prevent this? First you need to know what is in your soil, by having a soil analysis done. Once the lab results come back the ISA Certified Kingwood Arborists at Warren’s can put together a comprehensive fertilization schedule for you. DON’T USE WEED & FEED around your trees. The broad leaf weed killer in this product will hurt your trees. We see it all the time. Call Warren’s Tree Care at (281) 354-7111 to schedule an Arborist Consultation or fill out our online contact form. We are a licensed tree service company, serving our customers for many years with a diverse range of tree services.